Abstract: Dispersed fossil miospores and acritarchs have been recovered from the subsurface pelites in the Uhrice-1 borehole, southern Moravia. Spores of ferns, sphenopsids and lycopods with rare marine microplankton (acritarchs and chitinozoans) cysts indicate a predominantly continental environment with a limited marine influence. Dispersed miospores with cysts of unicellular marine microplankton confirm the Middle Devonian, most probably early Givetian (AD lem) age of marine transgression in southern Moravia. Thermal alteration of palynomorphs shows average values, with TAI ranging from 2+ to 3+, corresponding to 60–70 °C. 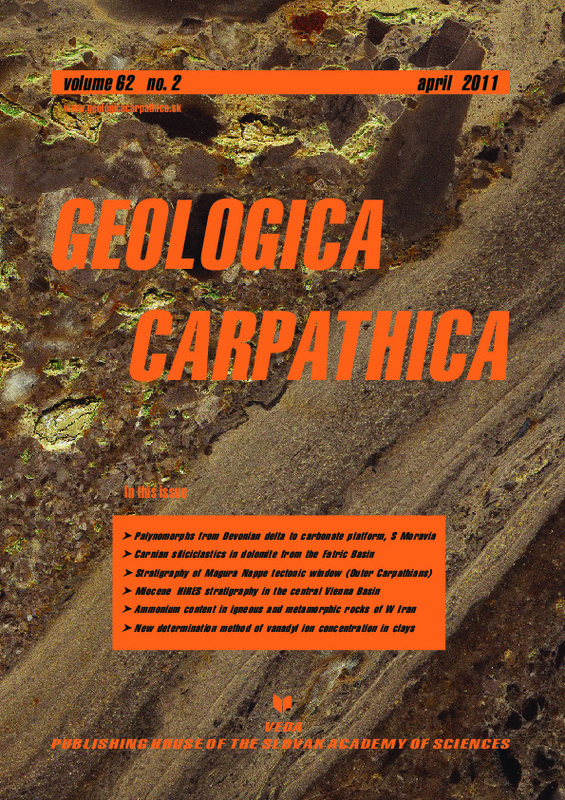 Abstract: The Upper Triassic carbonates of the Krizna Unit in the eastern part of the Krivanska Mala Fatra Mts contain the unique siliciclastic interbeds. They are developed between the Ramsau Dolomite Formation and the Hauptdolomite Formation, and comprise alternating dark grey shales and pale grey dolomites. Such a shaly-dolomite formation is unknown from the Upper Triassic formations of the Krizna Unit, which makes it possible to define a new lithostratigraphic unit (Trzinovo Formation). The Ramsau Dolomites beneath the Trzinovo Formation contain microfauna of Carnian foraminifers. Therefore, the Carnian age has also been constrained for the Trzinovo Formation, which by the reduced carbonate productivity and enhanced terrigenous influx could be related to the Reingraben Event. This event related to the “Carnian Pluvial Episode” is also inferred in the Trzinovo Formation by the presence of lingulide brachiopods (Lingularia) and spinicaudatan crustaceans (Euestheria). This fauna provides evidence of not fully marine conditions of the Trzinovo Formation, influenced by continental freshwater influx and humid climate. Abstract: The Światkowa Wielka Tectonic Window belongs to the Grybów Nappe of the Fore-Magura Group of units. This tectonic window is located in the marginal part of the Magura Nappe and is composed of Oligocene — Sub-Grybów Beds as well as the Grybów Marl Formation. These beds have been correlated with the Oligocene deposits of other tectonic windows of the Grybów Nappe in Poland. Our research reveals that the Krosno beds’ shally facies, which occur at the western termination of the Światkowa Wielka Tectonic Window, belong to the Dukla succession. On the basis of calcareous nannoplankton analysis, the Grybów Marl Formation as well as the Krosno Beds belong to the NP23–NP24, and NP24 Zones, respectively. The structure of the Światkowa Wielka Tectonic Window reveals a multi-stage evolution of the Magura Nappe overthrust onto their foreland. Abstract: In order to determine the relative contributions of tectonics and eustasy to the sedimentary infill of the Vienna Basin a high-resolution stratigraphic record of a Middle to Late Miocene sedimentary sequence was established for a well (Spannberg-21) in the central part of the Vienna Basin. The well is located on an intrabasinal high, the Spannberg Ridge, a location that is relatively protected from local depocentre shifts. Downhole magnetostratigraphic measurements and biostratigraphical analysis form the basis for the chronostratigraphic framework. Temporal gaps in the sedimentary sequence were quantified from seismic data, well correlations and high-resolution electrical borehole images. Stratigraphic control with this integrated approach was good in the Sarmatian and Pannonian, but difficult in the Badenian. The resulting sedimentation rates show an increase towards the Upper Sarmatian from 0.43 m/kyr to >1.2 m/kyr, followed by a decrease to relatively constant values around 0.3 m/kyr in the Pannonian. The sequence reflects the creation of accommodation space during the pull-apart phase of the basin and the subsequent slowing of the tectonic activity. The retreat of the Paratethys from the North Alpine Foreland Basin during the Early Sarmatian temporarily increased the influx of coarser-grained sediment, but eventually the basin acted mostly as a by-pass zone of sediment towards the Pannonian Basin. At a finer scale, the sequence exhibits correlations with global eustasy indicators, notably during the Sarmatian, the time of greatest basin subsidence and full connectivity with the Paratethyan system. In the Pannonian the eustatic signals become weaker due to an increased isolation of the Vienna Basin from Lake Pannon. Abstract: The ammonium (NH4+) contents of the Malayer area (Western Iran) have been determined by using the colorimetric method on 26 samples from igneous and metamorphic rocks. This is the first analysis of the ammonium contents of Iranian metamorphic and igneous rocks. The average ammonium content of metamorphic rocks decreases from low-grade to high-grade metamorphic rocks (in ppm): slate 580, phyllite 515, andalusite schist 242. In the case of igneous rocks, it decreases from felsic to mafic igneous types (in ppm): granites 39, monzonite 20, diorite 17, gabbro 10. Altered granitic rocks show enrichment in NH4+ (mean 61 ppm). The high concentration of ammonium in Malayer granites may indicate metasedimentary rocks as protoliths rather than meta-igneous rocks. These granitic rocks (S-types) have high K-bearing rock-forming minerals such as biotite, muscovite and K-feldspar which their potassium could substitute with ammonium. In addition, the high ammonium content of metasediments is probably due to inheritance of nitrogen from organic matter in the original sediments. The hydrothermally altered samples of granitic rocks show highly enrichment of ammonium suggesting external sources which intruded additional content by either interaction with metasedimentary country rocks or meteoritic solutions. Abstract: A novel and simple method for quantitatively determining the concentration of vanadyl ions in clays using electron spin resonance data has been developed. Several vanadyl standards with concentrations between 200–1000 ppm were prepared in a mixture of glycerol and kaolinite (KGa-2). The anisotropic electron spin resonance (ESR) spectra were recorded at room temperature, and the specific intensity of the line (attributed to nuclear spin m =–5/2||) was determined. For vanadyl concentrations between 50 ppm and 200 ppm, the standards must be prepared by mixing kaolinite with known vanadyl content (FBT2A-03) and kaolinite (GB1) containing no vanadyl. The method is applicable without modification to other clays and clay-rich sediments containing vanadyl ions. The whole procedure is very suitable for routine work.